Bear Creek Lodge - Waterfront creek, ample mountain air and a true mountain cabin! 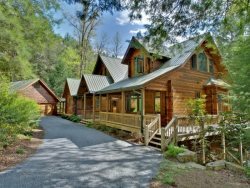 Come enjoy the beautiful setting of Lucky Lake in this beautiful Blue Ridge Mountain Cabin Rental. Lucky Lake has all the amenities you will need to have a romantic weekend alone or a fun filled week with the kids. 'Lucky Lake' is a secluded log cabin, on a spring fed lake, located in the famous Blue Ridge Mountains. Nestled in the quiet Cherry Log area with perfect terrain for long walks and more intense hiking. Less than 10 minutes to Historic Downtown Blue Ridge. This 2 bedroom, 2 bath cabin has a wood burning fireplace, and many other amenities. Relax in the master bath spa while surrounded with candles, or enjoy the evening sunsets soaking in the hot tub on the covered deck. Sit in the swing near the lake. Have an outdoor fire summer or winter and cook some Smores. Wildlife is abundant, deer walk through the property all the time, there is usually a pair of Canada Geese looking for a handout of bread. Fill up the bird feeders and be amazed at how many birds show up. Water from the lake continuously flows over the dam. The water falls about 80 feet to the second of the three lakes. Depending on the amount of rain this can change from a slow trickle to a racing waterfall. Don't be surprised if you forget about the rest of the world. You are sure to have a great time while enjoying the Lucky Lake right out your back door. This Blue Ridge cabin Rental is sure to leave you with a great memory of the tranquil Blue Ridge Mountains and all the nature that the mountains have to offer. Simple to rent. Easy process, good people. Package was ready when promised, cabin was prepared for us nicely. Really enjoyed it. Quiet. Rustic feel. Hominess of the cabin. Was well-outfitted and comfortable. Everything worked. Lake was GREAT. Living room chair and couch were comfortable. I only experienced the team through emails, however everything was answered, no surprises and just an overall great experience. It was something that words can't describe, a fantastic stay. Waking up every morning and enjoying coffee on the porch and enjoying the birds and wonderful view was like no other. I work as a paramedic and this was a wonderful way to escape the everyday life of such a busy and high demand job. It was the best vacation to this day. I would highly recommend Georgia Mountain Cabin Rentals due to the ease and everything that was promised was delivered. The staff was helpful and very nice. The cabin was ideal for my wife and I. The lake was wonderful and you could actually seat on the porch and watch the fish swim around. We loved waking up to birds too birds chirping and the little squirrels on the porch. If you're looking for a quiet getaway this would be perfect. My wife and I will definitely be back. Super comfortable and relaxing. Great getaway. It is a beautiful and peaceful place. This is our second stay and the cabin really isn't missing a thing. This was our first visit to Blue Ridge, GA and we were so delighted with our rental and area activities that we will make this one of our family destinations. Super friendly Very clear on Information . We stayed for 4 days at the end of our honeymoon my husband works for UPS and has a very fast-paced stressful job. We were so relaxed. We were so comfortable. The place truly felt like home we cannot wait to come back and stay probably at Lucky Lake again. Possibly at a larger unit next time and bring our children to enjoy the fishing and the hiking and the kayaking thank you for the Memories. The Wilsons PS I have some great pictures of the turtle and the catfish in Lucky Lake if you would like me to share. Prices were very reasonable, beautiful location options and being able to bring the fur baby along.. Wonderful vacation, all our expectations were met in regards to the cabin and the property..
We met the owner and he was a really nice guy! The girls at the office were great too! Enjoyed it! The cabin is great. Very clean...not that "icky" feeling at all!! we loved the cabin an it was so refreshing to sit on the porch an listen to the rain falling tru the tree's an the birds seem to be talking to each other with the different sounds all thru the woods it was a great relaxing visit loved it. As above, Daphe was amazing, and even came up to check on us with the maintenance guy and Amber, they were all great and so friendly and accommodating. Thank you so much for a wonderful experience. They checked on us after a huge storm that took down trees and power lines. They were wonderful And the maintenance guy was so nice and checked the hot tub for us and made sure everything was running properly. It was the peace and quiet we needed. Even with the storm , it was even more lovely than we expected. We could actually move right in. That was amazing!!!!! every amenity. Thanks so much for a great get a way experience!!! Excellent reservation and check-in process. Friendly and helpful staff. Very nice cabin with a beautiful, peaceful, and private setting. The two BR and two baths were very spacious and LR/kitchen/DR area was adequate. Small lake/large pond was great. Clean lake full of fish and very easy to launch kayak. Our office is closed on major holidays. *You may reach us after office hours until 5 pm Monday-Saturday by calling our toll free number at (706) 632-5751. If there is no answer, please leave a message! Emergency after hours: (706) 632-5751 If there is no answer, it is very important to leave a message! We can honor early arrivals, if schedule permits. An additional fee may apply, please contact our office to try to arrange an early arrival. It may be possible for a late check out, if schedule permits. An additional fee may apply, please contact our office to try to arrange a later departure time. *A partial payment of only $250.00 is required to reserve a cabin. *The remaining balance of the rental shall be paid in full ten (10) days prior to arrival date (Unless you make the reservation less than 10 days in advance, and at that time the reservation will need to be paid in full), with the exception of reservations that are scheduled for Thanksgiving, Christmas or New Year’s which shall be paid in full thirty (30) days prior to arrival.